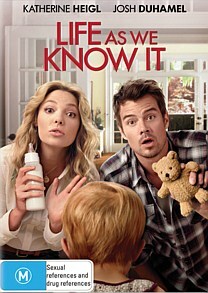 There’s a saying that tragedy loves comedy, and in the case of this heart-warming Katherine Heigl and Josh Duhamel rom-com fix, Life As We Know It, comedy definitely manages to weasel its way into a pretty depressing situation with that all too simplistic and predictable Hollywood feel. While this flick is intended to be a no-brainer viewing, it is disappointing in the sense that the premise actually holds potential for surprising and interesting insights into the dynamics of family life and the difficulties faced by fresh young parents when it comes to raising a child. Unfortunately, Life As We Know It, plays its story and characters in the straightforward style and conventions of the unmemorable romantic comedy formula as we’ve come to know it. Holly (Heigl) and Messer (Duhamel) are two opposing personalities. While Holly is successfully running a small bakery and expanding her work into restaurant potential, Messer is a network sports director who lets basketball games and multiple sexual partners take up most of his life. When the two are set up on a blind date by their best friends, who happen to be a married couple, their differences have them avoiding contact with each other as much as they possibly can. This, however, is made difficult when Holly and Messer become godparents to the daughter of their two best friends – Sophie – who falls into their care when her parents unexpectedly die in a car accident. Raised on tried and tested conventions of previous fail-proof crowd-pleasing romantic comedies, Life As We Know It nevertheless grows into a story that is more original and distinctive than most other eye-rolling love stories that involve two people who initially hate each other due to the polar extremes of their personalities. While bringing a baby into the mix contributes to more meaningful life lessons that require the characters to sacrifice career advancements and their own fears of becoming a responsible parent for Sophie’s happiness, many of these heartfelt moments are poor ways of compensating for dull jokes regarding baby poop and vomit, the unchallenging gender roles taken on by the two characters and the intensely flat happy ending that has been recycled time and time again in movies. Having said that, Katherine Heigl and Josh Duhamel have on-screen chemistry as a struggling, but endearing couple, enabling them to dominate most of the screen time without the need for slapstick sidekick actors that force humour onto the audience with their stupidity or eccentricity. In this way, Life As We Know It uses its baby factor as a way of exploring ideas of parenthood and romantic love as two intimately bound experiences, without diverting its attention to dumb jokes or unnecessarily inappropriate gags that mostly try to fill up time in other romantic comedies. With only a few additional scenes that don’t really need additional viewing, Life As We Know It, is a straightforward flick that could have been a little more provocative and interesting if it had fully embraced the baby’s presence as something more than just an excuse to glue two opposing people together. It’s not enough to have you laughing out loud, but its disappointing qualities won’t have you staying up at night.